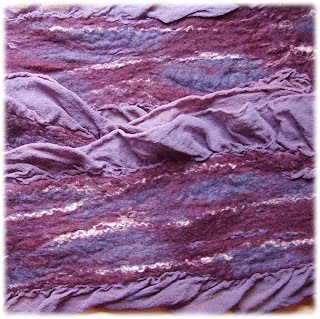 I just wanted to drop a line or two and share this purple frilly style nuno felted scarf. It too will eventually be for sale at Eclectics Gallery here in Kansas City. I'm also making some similar ones in different color schemes to go with it to the shop. These scarves are a combination of silk and wool with the occasional odd fiber like soy silk or linen added in for texture. I also hand dye the silk in most cases and really enjoy the entire process of making these. I'm trying to give myself a deadline of one more week to get all my little felted goodies finished to take down to Eclectics. Now I'm off because I need to get busy! I have no problem getting things started, but with a little baby in the house, it is a lot harder to get things finished now. Although, I don't mind because she's worth every minute of my time.